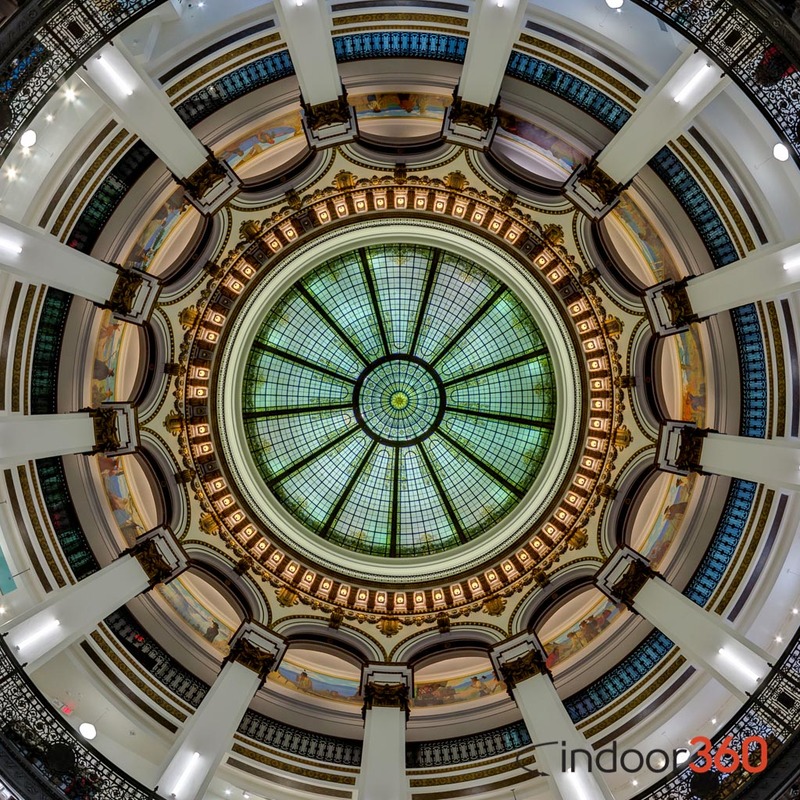 After closing for over 20 years, the magnificent Cleveland Trust Rotunda has been reopened to the public as part of the new Heinen’s Downtown Cleveland grocery store location. Over 100 years ago, Cleveland’s industry and population were exploding, and Cleveland’s financial institutions expanded along with it. Mergers brought The Cleveland Trust Company to new headquarters in 1908, featuring a rotunda that has been one of the city’s finest architectural treasures. Mergers in the early 1990s, however, caused this beautiful space to close to the public for over 20 years. Aside from hosting parts of the annual Ingenuity Festival for a few days in 2006, the building sat mostly unused during this time. Cuyahoga County eventually bought the building, but plans to relocate county offices to the complex never panned out. In 2012, the rotunda had its final hurrah as a bank in Marvel’s The Avengers. The building stands in for a bank in New York City where Captain America defends people cornered inside. Thanks to sustained efforts to bring residents back to Downtown Cleveland, population has surpassed 13,500, approaching the magic number of 20,000, seen as the minimum needed to support a supermarket. Rather than wait for this magic number though, locally- and family-owned Heinen’s Grocery Stores looked for opportunities to open one of their high-end supermarkets sooner—supporting their hometown and pouncing on the opportunity to open before national chains arrive. The Ameritrust Tower and its associated buildings, which include the Cleveland Trust Rotunda, were acquired by Geis Companies at the end of 2012. Geis intended to redevelop the entire complex into a hotel, apartments, and restaurants, branded collectively as The 9. Besides filling the vacant high-rise space, this redevelopment also created two big wins for Downtown Cleveland’s revitalization, by bringing Downtown Cleveland its first supermarket and reopening an iconic Cleveland landmark to the public. The new Heinen’s Downtown Cleveland location opened February 25, 2015. The Cleveland Trust Rotunda was designed by architect George B. Post, and features a Tiffany-style stained glass ceiling. Just below the ceiling, 13 murals painted by Francis Davis Millet entitled The Development of Civilization in America depict the exploration and settlement of the Great Lakes region. Be sure also to check out the well-worn Cleveland Trust Company seal at the bottom of this panorama. To compare the space as a banking hall to this panorama as a grocery, check out the historic photographs by Lauren R. Pacini at Artography Studios and Press.